Spices make food taste great, they make its flavor bitter or sweet, spicy or specific and strange. 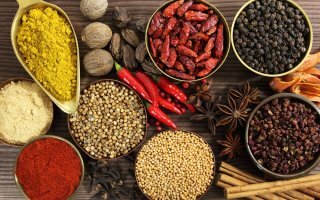 A spice is a seed, fruit, root, bark, berry, bud or vegetable substance primarily used for flavoring, coloring or preserving food. A spice may have other uses, including medicinal, religious ritual, cosmetics or perfume production, or as a vegetable. If you are intended to sell spices online, do it on Export Portal! We provide a place for safe trade and finding customers worldwide. Some plants contain phytochemicals that have effects on the body. There may be some effects when consumed in the small levels that typify culinary "spicing", and some herbs are toxic in larger quantities. For instance, some types of herbal extract, such as the extract of St. John's-wort or of kava can be used for medical purposes to relieve depression and stress. However, large amounts of these herbs may lead to toxic overload that may involve complications, some of a serious nature, and should be used with caution. Sell herbs online on our site, expand your business overseas! If you want to buy spices online, you are in the right place. Sellers from all over the world offer a wide range of spices on Export Portal. - Dried herbs and spices: asafetida, allspice, cardamom, cayenne pepper cinnamon, coriander seed, cumin, fennel seed, garlic powder, ginger, oregano, paprika, rosemary, turmeric, black pepper. - Fresh herbs: basil, curry leaves, dill, mint, parsley. - Spice blends, rubs and mixes: baharat, chili powder, chinese five-spice powder, curry powder, herbes de provence. Shop for food products online on Export Portal, make the best choice! Trade with Export Portal for the best results and increase your profits!